9th March 1796 was the day on which Napoleon Bonaparte, rapidly rising through the ranks of the French military, married Josephine Tascher de la Pagerie in a civil ceremony. She was the widow of a victim of the guillotine and had retained his name of de Beauharnais. Napoleon was very conscious of the age disparity between them in that she was 32 and he was 26. However, they got round the difficulty, and stopped tongues wagging, by lying about their ages. Josephine trimmed three years off her age and Napoleon increased his by two, by the simple expedient of borrowing his brother’s birth certificate for the occasion. Presumably nobody needed proof for Josephine’s claim – if she said she was 29 she was 29 and that was the end of it! It is common practice in France for weddings to be in two parts, with the legally necessary civil ceremony often followed by one blessed by the Church. 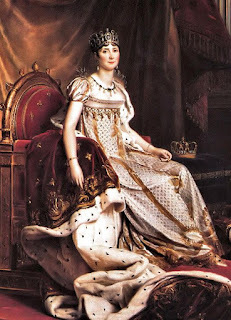 However, Josephine had to wait a long time to walk up the aisle – it happened only in December 1804, shortly before Napoleon was due to be crowned Emperor by the pope.